Thanksgiving is just a normal day on the International Space Station; however, the two NASA astronauts will share the tradition of the American holiday with the rest of the crew during their evening meal time. Of the six members of the Expedition 50 crew, three countries are represented: the United States, Russia, and France. Only the U.S. celebrates Thanksgiving; however, as an international crew, they celebrate each other’s holidays. “It’s going to be a little bit different for us up here in space, but I’m going to try to make it as much like home as we can,” said Shane Kimbrough, NASA astronaut and Expedition 50 commander. Kimbrough and Peggy Whitson are the two astronauts on board the outpost. They will be having an evening meal with some of the same items many American families will be eating today. Those include turkey, mashed potatoes, green beans and mushrooms, candied yams, cornbread dressing, cherry-blueberry cobbler, etc. The only difference is these items are prepared for spaceflight. That means they usually are either freeze-dried or thermostabilized. 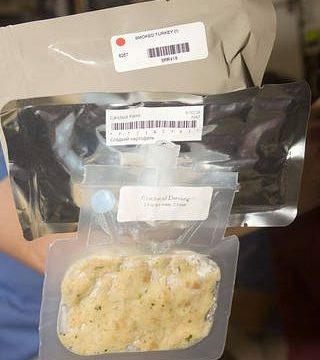 For the cornbread dressing, the NASA has given the exact recipe for the food item the astronauts will eat. It even includes instructions for spaceflight preparation. However, astronauts and cosmonauts don’t cook in space. There just isn’t the capability to do that. To eat a meal, they grab the packages of items they want and assemble a meal. Then they rehydrate and heat what they choose. In the case of the Thanksgiving meal, the traditional items were sent up in advance. Kimbrough personally assembled the crew’s meal to simulate as much as possible the idea of cooking for a group of friends and family. Once their workday is over, they will gather together and eat their food and discuss what they are all thankful for, just as millions of U.S. families do on Earth.